"But this White Rabbit laid down a blanket, opened a parasol, and PREPARED HIMSELF A BOWL OF TEA." I received a copy of Alice in Matchland by Mosoko Miyatsuki for free in exchange for an honest review. Alice in Wonderland is one of my favorite books, so I was excited to see how the creator wove this story into a cookbook. This little book is a unique hybrid between an illustrated storybook and a cookbook. 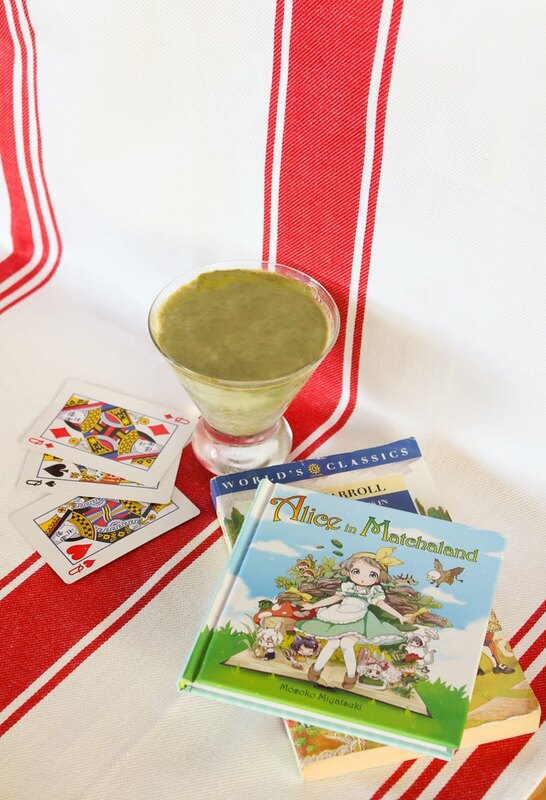 Alice meets the familiar Wonderland and Looking Glass characters, each of whom present to her a dessert or drink made with matcha. Recipes range from the simple essentials, like matcha tea, to the more complicated, like chiffon cake. The illustrations are cute anime re-imaginings of Lewis Carroll's creations - the dormouse, for instance, is a toddler with a tail, wearing a hood with mouse ears. The final products of the recipes are also illustrated, not photographed. The story blends anime and western allusions to fantasy - namedropping Totoro in one moment then referencing Hitchhiker's Guide to the Galaxy the next. I appreciate that the author included the more obscure characters from the original book - the dodo doesn't typically get as much love as the Mad Hatter - as well as some Carrollian words (frabjous!). On the other hand, the story doesn't capture the same absurd humor found in Carroll's tales, relying more on the "oh I understood that reference" sort of humor. As much as I love the concept of a storybook-cookbook, the recipes could perhaps have been tied a little more closely to the story. 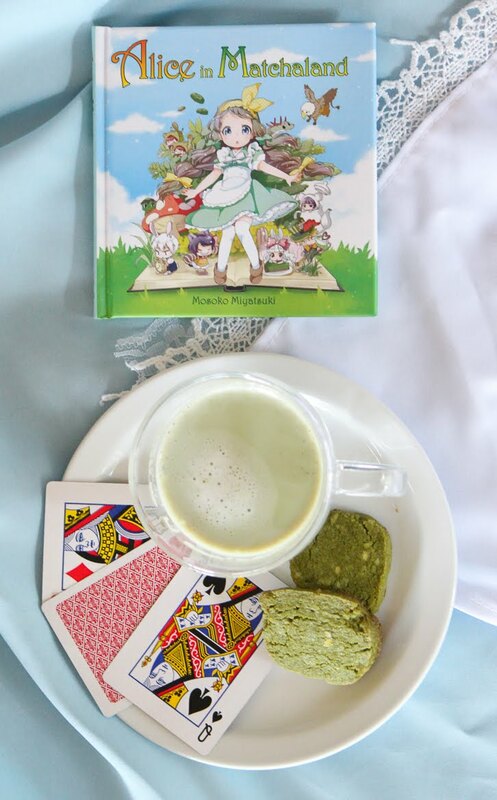 It isn't evident to me why the dodo provides Alice with matcha tofu blancmange and the Jabberwock gives Alice matcha gelatin. 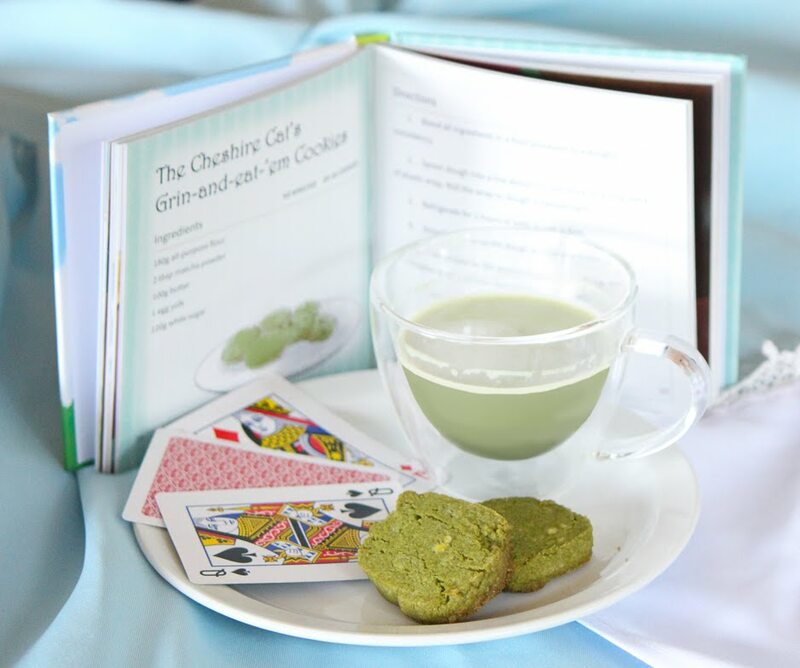 Because tea parties feature so prominently in the Alice in Wonderland story, I would have also liked to see more green tea takes on classic tea party dishes. For example, matcha scones or tea sandwiches with matcha cream cheese. However, the author does provide an interesting range of matcha recipes, as well as a few showstopper recipes that incorporate multiple recipes all combined into one bigger dessert. Because the recipes selected are typically quite simple - usually just three or four ingredients in addition to the matcha - the matcha flavor is very much on display in these recipes. The recipes themselves call for an unusual range of culinary skill. The recipe for matcha pancakes requires boxed pancake mix (why not make from scratch? ), while the chiffon cake requires whisking egg whites and egg yolks separately for 10 minutes each. Some specialized equipment is also required, like chocolate molds for the chocolates and a food processor for the cookies. The quantities of the ingredients are all in metric. I prefer baking in metric units, but some readers may find it discombobulating. The instructions are not always clear. For example, when I made the matcha pudding, I was instructed to pour the egg-milk-sugar-matcha mixture into the serving cups and heat the serving cups into a larger pot containing water over medium-low for 10 to 15 minutes or until the "surface of [the] pudding hardens." I would have liked to know factors like the suggested volume of the serving cups and the height of the water in the water bath. Should I have preheated the water before adding the pudding? I assume the "hardening" of the surface is a mis-translation that should be "solidifies." Less experienced chefs may also appreciate a reminder to stir the eggs while slowly pouring in the milk mixture to prevent egg scrambling. The quality of the printing and binding is great, however some of the translations or wording could be edited for clarity and flow. Some of the typesetting is also a little awkward (see below). The illustrations are beautiful. In summary, I would recommend this book for two target audiences. First, I think this would make a perfect addition to a little gift bag that includes matcha, a whisk and a tea bowl. 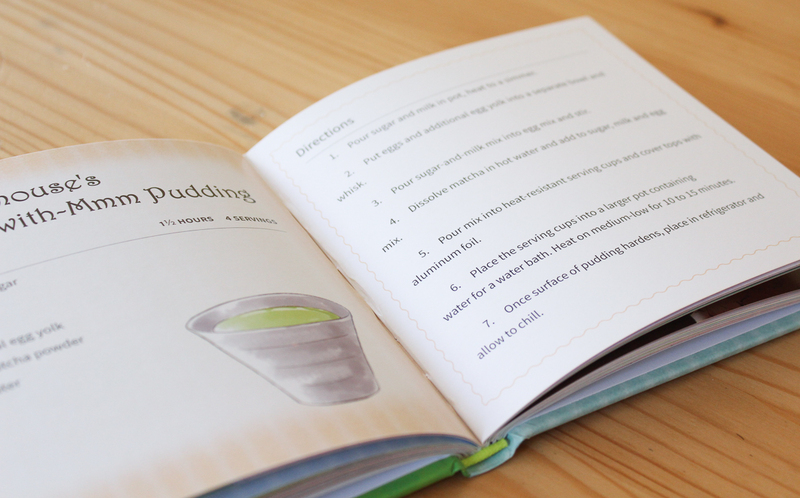 The final recipe in the book is a sufficiently detailed description of how to make matcha, while the other recipes are fun inspiration for other ways you can use the gifted matcha. Second, I think the book would be a fun introduction to baking for a child. I could see it being a great activity to read the story with a kid, and try to pick out a recipe to try together. Many of the recipes are simple enough that a child could perform them with supervision, and the plot and language of the story are similarly appropriate for a child. Thanks for the review of "Alice in Matchaland." We're glad you enjoyed the book, and the photos you took are adorable!